July | 2013 | That Was an Accident! Okay, so, I have a question. As a healer, how do you have a “reputable” performance when you’re grouped with either people who have fantastic gear, or the sort of people who like to be constantly healing whether it’s needed or not? Man, it didn’t seem like we were taking a whole lotta damage – time to help out with a couple Lightning Bolts! Zap! Wait, that doesn’t make sense. We MUST be taking damage. Oh, I see, Priests A and B are healing All The Things Ever. I should be helping with healing! But HOW? If I cast Healing Rain or Chain Heal now, it’d just be wasted mana, as everybody’s practically at full. Maybe I’ll Riptide some people. On the other hand, I don’t want them to think I’m doing NOTHING. The more they heal, the less I have to. As DPS, this sort of dynamic makes me go “GREAT! I LOVE YOU GUYS!” But as a healer and as someone who is perpetually concerned by mana consumption, I just wind up standing there looking kinda clueless. My brain is occupied with wondering what the eff would be the most efficient thing to do, because while I inevitably feel that I should be doing SOMETHING, I am simultaneously unable to figure out how to rationalize useless mana expenditures. The only thing I can figure is HEAL ALL THE THINGS MORE AND FASTER, by literally casting right out of the gate and never effing stopping, because if I let the other healers heal, I won’t have anything to heal. Competitive healing! This is the healing Olympics! If you’re starting a second late, you might as well not start at all! Go home, slowpoke, we don’t need you here. 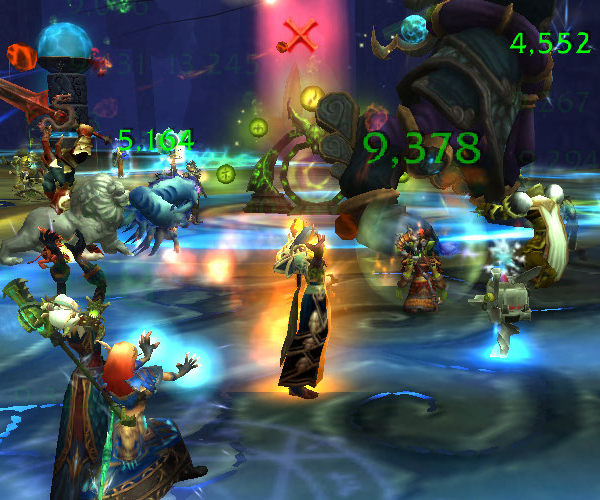 I don’t know if I’m really cut out to be a master of LFR/raid healing. 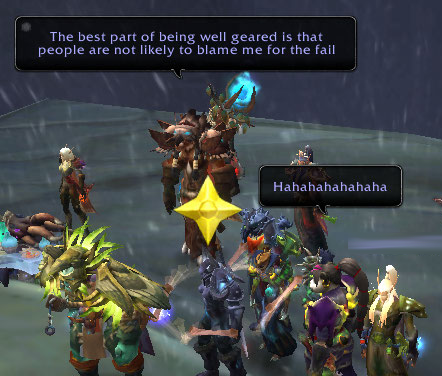 Heroics, heroic scenarios, transmog runs and so on are all good. Generally when I’m solo, I rise to the occasion. But when I’m grouped up with other healers, I just get all puzzled as to how to make a difference. This entry was posted in Bombelina, For the Horde, Baby!, Goblins, World of Warcraft and tagged bombelina (formerly electrika), goblins, healination is hell, healing, lfr, maybe someday will be better, oh the goblinity, shaman, world of warcraft on July 27, 2013 by Prinnie Powah. 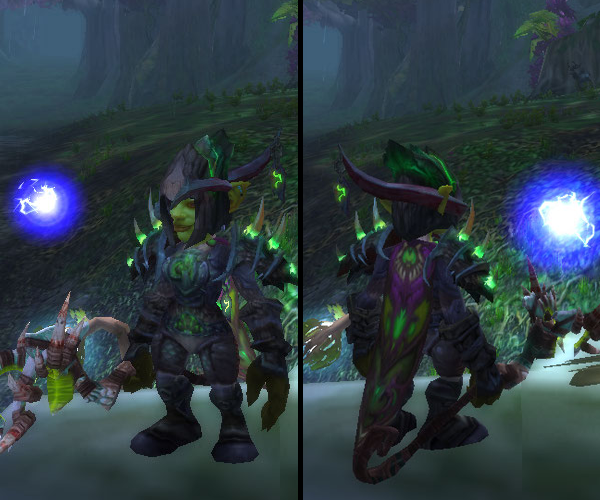 Thoughts: This is Electrika’s new transmog set for her Elemental spec. Have you ever used a guide to figure out what pieces you want for a set, only to find that THE PIECE OF YOUR DREAMS is no longer available and cannot be gotten for love nor money? I use Icy Veins for transmog planning. It’s not an infallible source, but it has my preferred format for these things – lots of pictures of items next to each other, on a class specific and slot-by-slot basis. It told me that THESE AMAZING SHOULDERS THAT WENT PERFECTLY AND WERE SO PERFECT IT WAS AMAZING could be had from Doris Chiltonius in Orgrimm … hold on, isn’t that the blood elf chick who sells Tyrannical PvP gear on the wall in Pandaland? Yes. She is not in Orgrimmar and has not been for some time. The shoulders are unobtainable. ICY VEINS, WHY U DO DIS, MY HEART, IT IS BROKEN. Yet I think being unable to get my ideal shoulders turned out to be a blessing in disguise. The bright orange in the Shoulders of the Groundbreaker ties in with the Crown of Flame and the Demonblood Eviscerator, while the dull gray color ties that in with the metal accents on the robes. Plus, these were cheaper in terms of effort – couple of heroics, and presto! I got enough justice to buy old school gear! You could consider this Attempt #2 at making “a cool fire set.” (Attempt #1 is here.) Is it better? Worse? I think it is an improvement. This entry was posted in Bombelina, For the Horde, Baby!, Goblins, Mail, Transmog, World of Warcraft and tagged bombelina (formerly electrika), cleated ice boots, conqueror's worldbreaker hauberk, crown of flame, demonblood eviscerator, goblins, mail, shaman, shoulders of the groundbreaker, time twister's gauntlets, transmogging, tyrannical gladiator's redoubt, waistguard of calibrated caliphracts, world of warcraft on July 23, 2013 by Prinnie Powah. Things can get a little chaotic. Healing makes every fight feel far faster to me (until I run out of mana), as I am intensely focused on that task and have an immense dread of seeing stacks of Determination upon my person. It’s not that I mind the wipes, because sometimes sheeyit happens. I’m just allergic to the jerks who start talking sheeyit in response to repeated ones. I. Hate. That “night” phase. Hate it. It’s a mana-sucking void of quasi-doom where people either stand in the Sunbeam and drop puddles of fear into it, or they never go into the Sunbeam and the stacks deal increasing amounts of damage while I am getting ever lower on mana. 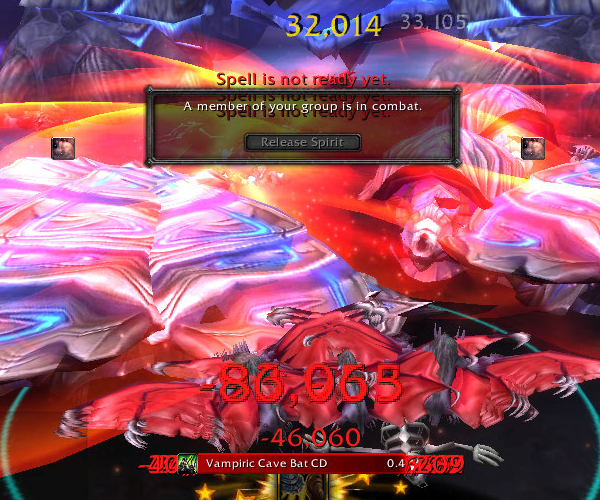 It’s not impossible, and my best buddy Tremor Totem helps out, but it’s not fun, either. Somewhere between the rising sense of “OMG, OOM” and praying for the DPS to kill faster plzkthx, I got a passive-aggressive thought going, “Well, I SAW ’em make a healthstone, so they should USE IT.” This inevitably collides with a sudden realization that I am glad I don’t actually know how many stacks of the debuff everybody has, because then I’d get depressed. I hate having to heal Tsulong too. FIRST you put me through the wringer with constant raid-wide damage that increases with each stack of the debuff, and NOW you want me to heal this mother trucking NPC too? Look, I say we heal him to death with swords some more. What does he actually do when he’s not terrified of the dark anymore (because we beat the sheeyit out of him), anyway? I STILL DON’T KNOW. On the upside, healing Sha of Fear is easy as … well, taking candy from a baby doesn’t do it justice, because the baby cries and throws a fit. @#$%ing ninety million @#$%ing turtles and ninety million @#$%ing bats and the turtles ricochet EVERY-FREAKING-WHERE and they interrupt me ALL THE TIME and it’s just, AUGH, GAWD I CAN’T STAND IT I HATE MY LIFE CASTING CRAP SHOULDN’T BE THIS HARD. Yo, I’m gonna Riptide you and toss out a totem, but that’s about it until Spiritwalker’s Grace is off cooldown. Stop standing in sheeyit, will you? Oops, there goes the bat tank. Well, @#$%, there goes the raid, the bats are chewing everybody’s faces off. @#$@ing turtles. @#$^ing bats. Because being dead does such wonders for your numbers. I agree. Of course, in stopping to take this shot, I died. Frankly, this can be a huge pro in the favor of DPSing, even if the DPS spec has the longest queue. p.s., Did you realize that there’s “ham” in “shaman” …? No WONDER I like it! This entry was posted in Bombelina, For the Horde, Baby!, Goblins, World of Warcraft and tagged bombelina (formerly electrika), goblins, healination is hell, healing, lfr, maybe someday will be better, oh the goblinity, raid finder, shaman, that's probably not good, world of warcraft on July 21, 2013 by Prinnie Powah. Thoughts: Yep. I’m wearing a treestump hat, I look ridiculous, and I LOVE IT. I want the heroic version next. Haters gonna hate. I wanted to screencap him actually saying it in person, if you will, but he wouldn’t say it again! This particular outfit is one that has undergone a large number of revisions as Electrika has leveled and other items became available. Once upon a time, it was intended to be an outfit she could wear around the 70s and discard once she hit 85, and it involved an entirely different selection of weird hat (the Dream-Wing Helm), shoulders (Thick Scale Shoulderpads) and chest (that fel iron mail that blacksmiths can craft). But then I didn’t dump the outfit like a hot potato. Instead, I kept on adjusting it to involve cooler things. The hat was the hardest thing to get, and not because Bastion of Twilight normal is a huge challenge at level 90 – it was more because nobody wanted to go, pretty much ever. I managed to luck out with it and the shoulders on the ONE Bastion of Twilight run I was able to get myself in. Cal has been trying to distract me from other things (as well as trying to prevent me from dragging him to the Bastion of Twilight), so when he heard of a group going there, he hooked me up. I am very, very thankful that the gear dropped and I got it, because I will probably never find another group again. This is sad, because I really want the blue heroic version too. The staff is, quite frankly, a stand-in. When I came up with the outfit originally (and when I started collecting crap for it), Ele was using a mace/shield combo. I REALLY want to go back to that. I just have to, you know, get a one-handed weapon. So far, I’ve gotten a staff (currently using), a shield, and an offhand. GO ME. 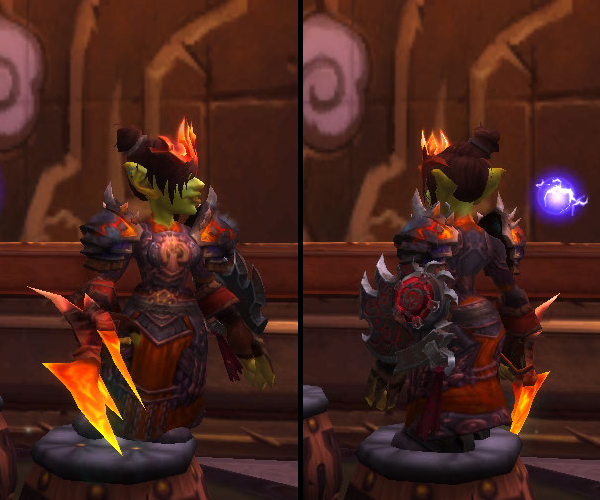 This entry was posted in Bombelina, For the Horde, Baby!, Goblins, World of Warcraft and tagged belt of the iron servant, bombelina (formerly electrika), cleated ice boots, feludius' mantle, firestrider chestguard, goblins, groovey legguards, handwraps of the raging elements, helm of the nether scion, mail, mindshard drape, shaman, the undeath carrier, transmogging, world of warcraft on July 11, 2013 by Prinnie Powah. About a week ago now, I finally started putzing around with Vuhdo. After first freaking out about All The Windowz because there are at least three to start off and that may be too many for me to mentally cope with (private tank? Wat? 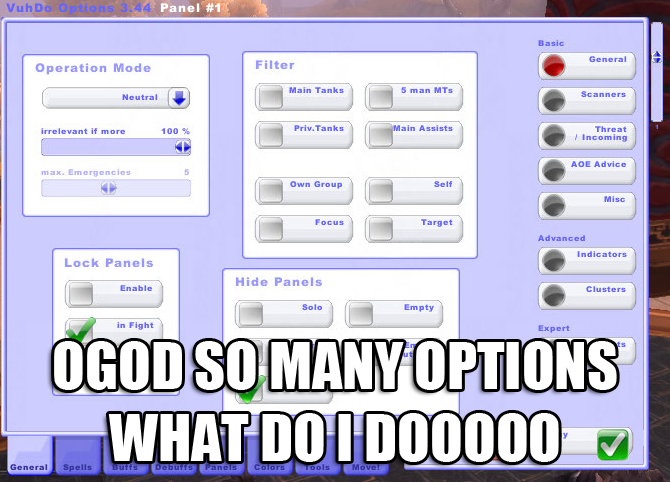 ), I then spent way too long trying to figure out how to get to the options. The other addons I use have options that I can access through the game’s interface menu, but Vuhdo doesn’t. It was like Vuhdo was laughing at me! LOL YOU’RE TRYING TO GET TO THE OPTIONS BY RIGHT CLICKING THE BOX WITH YOUR NAME IN IT THAT’S SO FUNNY DO IT AGAIN. Seriously, I’m glad hardly anybody does the Golden Lotus dailies these days, ’cause I was standing there at the Golden Pagoda, chaining the Chain Healing as though right clicking THIS TIME was going to do something different than it did the LAST TIME. Maybe if I hold down the right click, a new thing will happen! Nope. Chain Heal. Maybe I need to double right click! Nope. Chain Heal. All I wanted was some OPTIONS, not INDIGNITY, but alas – it seemed I was doomed to be stuck forever with the latter. Thanks to the assistance of a friend, I finally located the magical command (which has to be typed in the chatbox) that opens up the magical land of Vuhdo Options. So. Many. Options. There are tabs, and then the tabs have tabs! 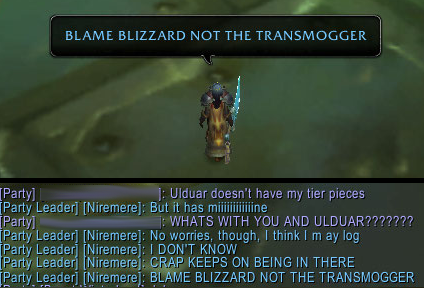 It probably didn’t help that I was attempting to LFR with my guild at the same exact time (CARRY ME, GUYS). 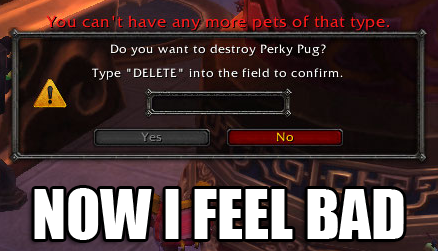 Actually, it turns out that messing with Vuhdo settings in combat is bad, because it causes it to bork. Point and click seems like ancient history now. It took a while, but I finally scored my first Big Achievement (and, sadly, #1 priority): making Vuhdo pretty. My second Big Vuhdo Achievement: discovering that Vuhdo is (one way) people get snappy res messages. Can I get a heck yeah? Res anywhere, anytime. Well, almost, anyway. I gotta get the spells I set in Vuhdo into muscle memory. I logically remember that I set Chain Heal to shift-right click (so I can’t accidentally repeat the Golden Pagoda scene), for example, but I need to know spell assignments to the point where I don’t have to even think about it, I just do. Since I currently have a limited number of mouse buttons available to me, I’ve tried to pick the “Important” spells. Setting Earth Shield to a mouse click has not wholly prevented me from casting it on myself by accident, but it has helped. I decided to go with Greater Healing Wave as my “solid” single-target spell because I currently have a set bonus for it. I’m also assuming that if they’re taking so little damage that I want to cast something like Healing Surge, I’ve got time to shift one of my hands to the proper keyboard button. Speaking of spells, another thing that broke my brain was the Vuhdo distinction between “profiles” and “key sets.” I spotted some checkboxes for activating a profile on switching to Spec 1 or Spec 2, so I thought I’d make one for each. It made sense to me to stick the healing spells Elemental has access to in the same general area (a.k.a. the mouse), since I do like to be prepared with some backup heals in OMFG emergency situations. Well, I Did It Wrong. Had I not been distracted by all ninety million options + spec 1 + spec 2 + boxes + wat is going on here, I would’ve noted the little text message that states, quite clearly, how profiles do NOT save spell bindings. Nope. Having not seen it though it was directly in front of my face, I proceeded to change the spell bindings for elemental, only to then discover they remained as such upon switching back to Resto. Bah. Turns out I needed to save different key settings. Once I got that figured out, I felt better. At this point in time, there are two things that bug me. 1.) 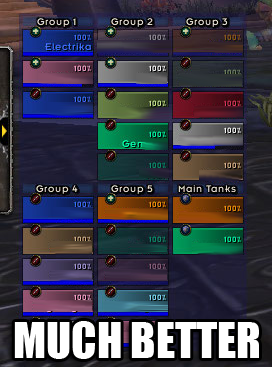 I have to open up Vuhdo options to type in the name of the tank for Earth Shield’s buff watch thing. When tanks drop like flies for unknown reasons, this can get annoying. (My tendency to type “/vudho option” is also annoying.) Similarly, I can’t figure out how to get the dang thing to switch the buffs to watch for different specs. It’s pointless for me to track Earth Shield when I’m in Elemental spec, so I’d rather make sure I have my own shield and weapon imbue up and running. This entry was posted in Bombelina, Goblins, World of Warcraft and tagged /omg, addons, bombelina (formerly electrika), goblins, healination is hell, healing, maybe someday will be better, shaman, vuhdo, world of warcraft on July 9, 2013 by Prinnie Powah.